Welcome to Day 17 of the 31 Days of iOS. Yesterday, we reviewed device orientation including how to detect when the orientation of the device changes and how to restrict what orientation a screen can appear in. Today we’re going to talk about how you can make use of the Debug Console. Compared to other integrated development environments (IDEs), Xcode leaves a bit to be desired when it comes to debugging an application. While many IDEs allow you to hover over a variable and see all of it’s properties whenever you hit a breakpoint, Xcode doesn’t really work this way. Thankfully, using the Debug Console, we can alleviate many of these issues.. We’ll be starting with a brand new project, but if you’d like to follow along with the completed code, you can access it here. Now let’s start using the Debug Console. The section in the bottom right can be used for looking at variables when you’ve hit a brakepoint (we’ll look at this for a moment shortly). The section on the right is the Debug Console. Because we logged something from our code, the console automatically appeared. 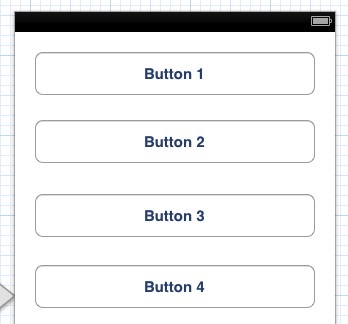 However, you can also open this manually by going to the View menu and choosing Debug Area and Activate Console. Also, you can tap command + shift + C and it will appear. Let’s look at logging something more complicated. 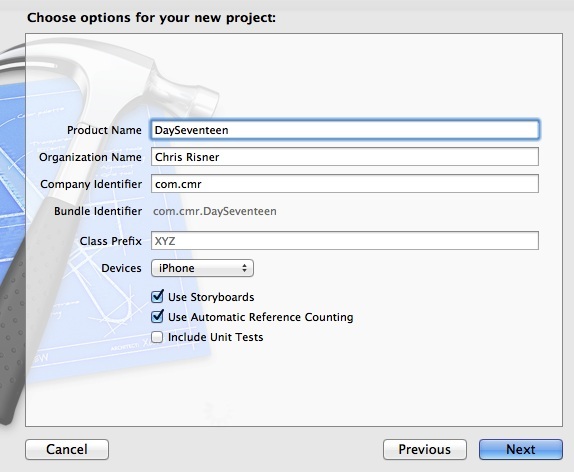 2012-11-25 16:07:14.388 DaySeventeen[12698:c07] Hello debug console! 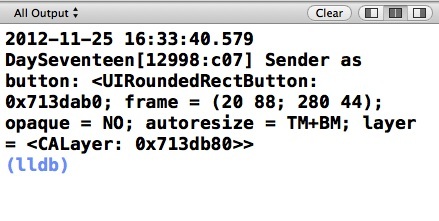 As you can see, the sender is the UIRoundedRectButton that we connected with the action method. The other information is relevant to the button, but doesn’t really mean a lot to us right now. One thing we’d like to see is that the text on the button is logged when we call NSLog. Let’s look at how to do that next. However, one of the most powerful uses of the Debug Console is printing out expressions on the fly. Let’s do this now to print out the same text property without requiring a log statement. (NSString *) $11 = 0x0713da20 @"Button 2"
So if you have a breakpoint in your code and need to get more information about a variable or an object, you can use the print statements in the console to print out information on the fly (without having to add a NSLog statement and restart your app) even though Xcode doesn’t show you very much information in the variable window. Today we looked at how to make use of the Debug Console. There are two different ways we can take advantage of the console: with NSLog statements and manually using the po and print commands. The console is incredibly powerful and allows developers to get on the fly information out about what’s going on in their application. While this is going to be the primary usage of the console, you can see the other uses and abilities of the console by using the help command. You can access the finished source code from today here.